Martin ’20 were bright spots, as Prince recorded three goals and notched two assists across the two games and Martin had a fantastic game against Hartford with five goals and one assist. The Big Green look to bounce back next Saturday against the University of Pennsylvania. ’19, with Carson scoring four goals and Brewer adding three. 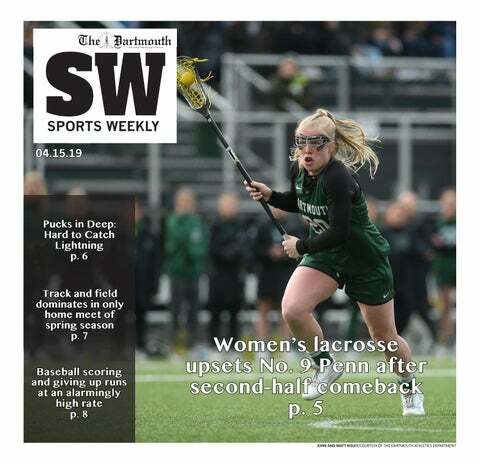 Dartmouth outscored Penn 11-5 in the second half. Kellen D’Alleva ’19 also had an impressive showing with a goal and five assists. With this victory, the team is 8-4 going into its final three games before the Ivy league tournament. The Big Green will play Vermont on Tuesday and Cornell University on Saturday. 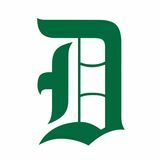 The Dartmouth baseball team won the series 2-1 this past weekend against Brown University. innings. Murray gave up just two runs on four hits, with three strikeouts to top it off. Steffen Torgesen ’19 had three of Dartmouth’s 10 hits with a double, a run and an RBI, and Nate Ostmo ’19 homered to help seal the deal. The series win moves Dartmouth to 11-18 overall and 5-7 in Ivy play. The Big Green faces Middlebury College on Tuesday and has a big weekend series at home against Harvard University. but was narrowly beaten by 5.6 seconds. In its only home match of the season, the women’s rowing team impressed with wins in all four races. Dartmouth’s first Varsity 8, stroked by Sophie Stone ’21 and coxed by Katie Erdos ’20, won by more than seven seconds with a time of 6:18:21, and the second Varsity 8 won by more than 10 seconds with a time of 6:36:31. Next weekend, the women’s team travels to South Carolina to compete in the Clemson Invitational, the heavyweights travel to Boston University for the Bill Cup, and the lightweight team travels to Yale for the Durand Cup and then Columbia for the Subin Cup. The men’s tennis team beat Brown on the road and Yale at home. The Big Green has won 11 of its last 13 matches. play against Columbia and Cornell University, both of which are 4-0 in Ivy League standings. Despite strong singles performances, the women’s team narrowly lost to Brown on Friday 4-3. After the Big Green dropped both doubles matches, they needed something big in singles. Racquel Lyn ’20, Abigail Chiu ’21 and Chuyang Guan ’20 won their respective matches at the 1, 2 and 5 spots, but it wasn’t enough, as Brown took the 3, 4 and 6 spots. Dartmouth fell to Yale on Sunday 4-0, dropping to 3-16 overall and 0-5 in Ivy play. The women to get back on track next weekend against Columbia and Cornell University. 11th inning clinched the win for Harvard. In the third game of the series, Dartmouth battled back in the seventh inning to put the game within one run, but ultimately fell to the Crimson 4-3. Wilkison had another strong outing on the mound, allowing just two earned runs on two hits over 4.1 innings. Ward and Schroder built off their Saturday performances with two hits and three RBIs between the two. Dartmouth travels to Ithaca next weekend to take on Cornell in a three-game series. hammer throw, Rachel Donner ’22 won the shot put, Lily Lockhart ’21 won the discus, Maria Garman ’19 won the javelin, Julia Valenti ’20 won the pole vault, Olivia Goodwin ’21 won the long jump, Camille Landon ’21 won the high jump, Breanna Glover ’22 won the 1500m, Danielle Okonta ’20 won the 400m hurdles, Eliza Dekker ’19 won the 800m, Caroline Walter ’21 won the 400m, Nicole DeBlasio ’19 won the 200m, Cha’Mia Rothwell ’20 won the 100m hurdles and the 4x100m relay team took the top spot. Additionally, the women’s team had a run of second and third place finishes. These include Alexandra Collins ’19 in the hammer throw, Lockhart in the shot put, Donner in the discus, Brooke Brunet ’21 and Goodwin in the pole vault, Rothwell in the long jump, Zoe Dainton ’22 in the high jump, Margaret Tuthill ’20 and Julia Stevenson ’20 in the 1500m, Grace Thompson ’19 and Georgia Fear ’20 in the 800m, Elizabeth Wilson ’22 and Kathryn Laskoski ’21 in the 400m as well as Walter and Wilson in the 200m. Next weekend, the Big Green will compete at meets in Princeton, NJ, Charlottesville, VA, and Boston, MA. the Big Green was Brown. Next weekend, Dartmouth will compete in the New England Women’s Championship at the Massachusetts Institute of Technology, the George Morris Trophy at Boston University, the Admirals Cup at U.S. Merchant Marine Academy Kings Point and the Boston Dinghy Cup at Harvard University. Tuesday BB vs. Middlebury, 4:00 p.m. WLAX @ Vermont, 4:00 p.m. All Weekend MGOLF @ Ivy League Championship WGOLF @ Ivy League Championsip WTRACK @ Virginia Challenge WTRACK @ Larry Ellis Invitational WTRACK @ Carisella Invitational MTRACK @ Virginia Challenge MTRACK @ Larry Ellis Invitational MTRACK @ Carisella Invitational Saturday LROW @ Yale (Durand Cup) HROW @ Boston University (Bill Cup) BB vs Harvard, 11:30 a.m. WTEN @ Columbia, 12:00 p.m. SB @ Cornell, 12:30 p.m. MLAX @ Penn, 1:00 p.m. WLAX vs Cornell, 1:00 p.m. MTEN vs Columbia, 1:00 p.m. SB @ Cornell, 2:30 p.m. BB vs Harvard, 3:00 p.m. Sunday LROW @ Columbia (Subin Cup) BB vs Harvard, 12:00 p.m. WTEN @ Cornell, 12:00 p.m. SB @ Cornell, 12:30 p.m. MTEN vs Cornell, 1:00 p.m.
Another strength of the Big Green this season has been the t e a m ’s d e p t h . O n S at u rd ay, seven different players scored for Dartmouth. Attacker Ellie Carson ’20 led the team with four goals, and attacker Kellen D’Alleva ’19 had a game-high six points. “We have a lot of depth this year, which we haven’t always had in the past,” Giroux said. “In any given game, there could be 10 different scorers, which makes us a really hard team to scout.” Penn is the highest-ranked team in the Ivy League, but the Big Green has faced tough competition this season. The team opened the year on the road against Northwestern University and the University of Michigan and played on the road at No. 1 Boston College. “Our players feel battle-tested, and that helps ease the nerves going into the game,” Spencer said. “We feel like we’ve got some good games under our belt.” Giroux noted how the tough schedule has helped the team play well against Ivy League opponents. “Part of the thought of making our schedule so tough at the beginning was to prepare us for our most important Ivy games,” she said. The Big Green will look to build momentum as it concludes the regular season. Sweeney said Saturday’s win gives the team confidence heading into the final two weeks of Ivy League play. D a r t m o u t h w i l l t r ave l t o play non-conference opponent University of Vermont on Tuesday before playing its final home game of the season on Saturday against Cornell University. The following weekend, the Big Green will wrap up the regular season with a matchup at Yale University. “We have a few more tough opponents, but I think we can come out with a win against all of them,” Giroux said. The Big Green is hoping that the win will increase its chances of making the NCAA Tournament come May. The team boasts an 8-4 record with a 4-1 mark in conference play. a 5-1 win to take a 2-0 series lead. To make matters worse, Kucherov threw a reckless hit that earned him a meeting with NHL player safety and a one-game suspension. This is not to say that the Lightning are doomed. The Caps trailed the Jackets 0-2 going back to Columbus in last year’s first round series and rallied to win four straight and eventually the Cup. But both games were extremely close, and the Caps roster was also at full strength as they made their run. This is the way of the Stanley Cup playoffs. Wherever there appears certainty, it is an illusion. To see the Lightning look mortal, — let alone in dire straights just two games into their quest to re-take the Cup — is astonishing, especially given their dominant regular season. Whether they rally from this deficit or flame out in spectacular fashion, it’s crucial to recognize how special this Tampa season has been. Remember that when they inevitably shred some poor penalty kill with crisp, one-touch, tape-to-tape passes. Remember that when their year ends in a handshake line — whether as the victors or the vanquished. team score with wins in the 100m and 200m races. Her contribution was one of many track events the women won as the team also raced to victory in the 400m, 800m, 100m hurdles and 400m hurdles. Caroline Walter ’21, Eliza Dekker ’19, Cha’Mia Rothwell ’20 and Danielle Okonta ’20 won those races respectively. Julien Hinz ’22 won the men’s 800m while Ryan Cashman ’22 and Shawn Ohazuruike ’20 took first in the men’s triple jump and 110m hurdles, respectively. Competing at home can be a different but welcoming experience, especially for the track and field team, which is used to travelling by bus or flying to meets on weekends. about competing at home. “It’s awesome,” he said. “We don’t get a lot of opportunities to compete here at Dartmouth, so you have to cherish each one of them. It’s always fun to have some of our friends come support the track team.” The Big Green is roughly three weeks away from the 2019 Ivy League Heptagonal Championships which will take place on May 4 and 5 at Princeton University. The New England Championships will occur the following weekend and several athletes hope to qualify for regional and national meets. Pickett is a former member of the Dartmouth track and field team. bats in college, a lot of the difference in runs scored is due to the increase in quality pitchers and the depth of MLB pitching staffs and bullpens. This allows teams to keep their most talented pitchers rested throughout the season, whereas college teams may not have as many quality arms in the rotation. Even in comparison to lower levels of baseball though, Dartmouth’s recent games have been high-scoring. “They’ve been more high scoring than I was used to in high school,” Bryce Daniel ’22 said. After its fourth weekend of Ivy League play, Dartmouth is past the halfway point and has three more weekends to try to earn a spot in the Ivy League Championship as a top-two team in the conference. If the first half of conference play was any indication, the next few weeks will consist of exciting baseball as the Big Green look to climb back into the race for the Ivy League crown.